This edition of the LP is limited to 500 copies. It includes a gatefold jacket and fold out poster. Flawless Talent on recordings and live! The sound of Scenery is immaculate. Emily King is where Vintage and Modern music meet for tea. In Love! I love the white Vinyl, so stylish! 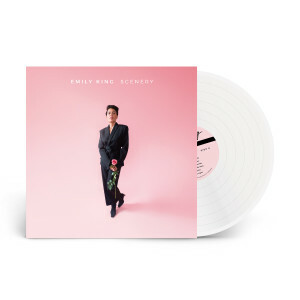 Emily King is my favorite artist and for her to sell her album as a record, makes me love her EVEN MORE!!! I've received my record and just love it! The shipping was sent fast and I had purchased it as a pre-order. I hope each album Emily drops, she gives the option to purchase it as a record and through ATO records! I love the sound of the vinyl album. We have a nice collection of new albums, old and original presses, etc. so sound quality is important. The album sounds good, is beautifully packaged, LOVE that the lyrics are included and the posters. And of course, Emily King is AMAZING. Her songs are just beautiful, her vocals, the instruments... I am thoroughly pleased and thoroughly grateful that my husband surprised me with her vinyl album. I already listened to Scenery, and have been a fan of Emily King for a while, so I knew it would be a fantastic purchase. The white vinyl was a great touch, and a welcome addition to my burgeoning record collection. This was gifted to me, and is a stellar album. Definitely worth the “never heard it before” risk. Great quality pressing, no clicks, pops, or warping. Great album. Love love LOVE. I was very happy with the packaging the record came in and it looks even more amazing in person. Sounds perfect. Ordered and I’ll love it! That’s a fact! She can’t do any wrong when it comes to music.